I am back! Sorry for disappearing again. Just busy with life, ya know? I&apos;ve had this chapter started for a while now.. and never got it finished. I&apos;m making it sound like I&apos;ve been gone for months, when really, it&apos;s just been, what? 9 days? I&apos;m not happy with myself. I sould have been done already! Alright, less rambling, more writing/reading! "Mabel, Grunkle Stan! I&apos;m home~!" All Dipper got for an answer was a grunt from the living room. "Guess Grunkle Stan wasn&apos;t too worried about me." This thought was soon followed by the loud sound of wheels rolling down the hall, then Mabel appearing in the doorway, giant water tank and all. The cervitaur watched as a relieved grin slowly spread across the mermaid&apos;s face. "Dipper! Oh, I was so worried; you didn&apos;t come back yesterday and- ah! Who&apos;s this??" Mabel raised an eyebrow, grin growing wider as she rolled her tank closer, leaning over the edge and lightly elbowing her twin in the side. "A New friend? Or, perhaps," Mabel pretended to let out a surprised gasp. "is he something more then a friend? Dipper, finally! I&apos;ve been waiting so long for this moment!" William really didn&apos;t know how to act in this kind of situation. He wasn&apos;t surprised to see a mermaid, when you see an actual cervitaur, you&apos;ve seen everything. But, now she was thinking they were in a relationship? 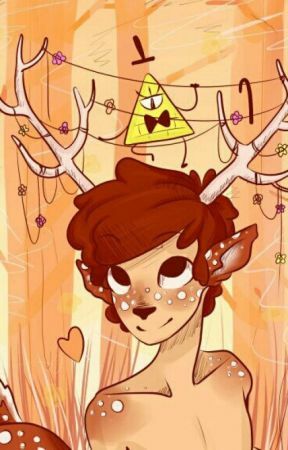 Yeah, he liked Dipper and wouldn&apos;t mind if they were dating. It was too early though, even for him. But that didn&apos;t mean he&apos;d stop teasing and flirting with the cervitaur. "M-Mabel! We&apos;re not dating!" Dipper sqeaked, "I just... met him in the the forest.." the cervitaur resisted the sudden urge to bolt and hide. His instincts tell him to do one thing, his mind tells him to do the other. It was rather frustrating, really. "Met him in the forest, huh? How romantic! Was it last night, while the sun was just setting? That would be the best place to have met your boyfriend!" Mabel clapped her hands together, a slight blush dusting her cheeks as she stared off into the distance. "Hey, that&apos;s actually a good idea! I&apos;ll do something like that with Paz sometime!" Dipper groaned dramatically, eyes flicking back toward William. William got the hint. Taking a step forward towards the mermaid&apos;s tank, he held his hand out. "Hiya! My names William, but you can call me Will if you&apos;d like!" Mabel took his hand, and William gave it a firm, but gentle, shake. Leaving the hunter&apos;s hand dripping. Mabel&apos;s grin grew wider, if that was even possible. "Hey, Will! My names Mabel, Mabel Pines!" "So I&apos;ve heard.." William answered back with a laugh in his voice. It was now that Mabel noticed the bandage wrapped around Dipper&apos;s back leg. 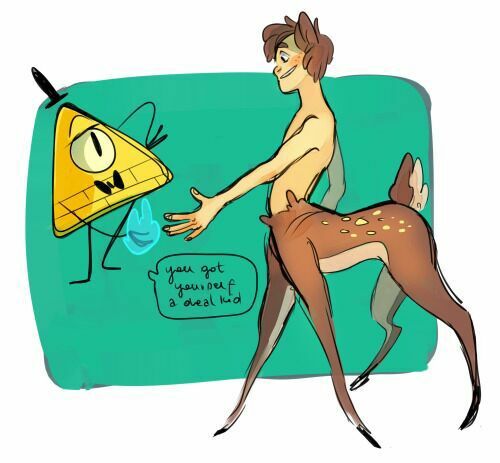 "Omg, Dipper!! What happened!?" She practically screeched. Oh. Dipper completely forgot about that. Now that he wasn&apos;t focused so much on his feelings for Will he could now feel the throbbing from the wound that he had gained the day before. The surprise of the pain sent him kneeling on all four of his deer legs. William made a startled sound and put a hand on Dipper&apos;s shoulder to steady his human half. "Hey! You, okay??" Will questioned, alarmed by the sudden fall the cervitaur took. Mabel joined in, leaning farther out of her tank and placing her hand on her twin&apos;s free shoulder, asking if he was alright and if he needed anything. 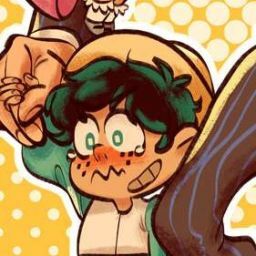 Dipper gritted through clenched teeth, "I&apos;m fine, I&apos;m fine! Just, h-help me up, we&apos;ll go to the kitchen.. and e-explain everything, okay?" Mabel asked what happened, and he was going to tell her the truth. Took a while, but eventually they got everybody seated in the kitchen. Well, William was the only one actually sitting in a chair. Mabel just floated in her tank and Dipper rested on the floor against the counter top. Mabel glanced from Dipper to William, "Okay, now, if you could tell me the truth of what exactly happened, that would be great." Sorry there was barely any Grunkle Stan in here! I&apos;ll be sure to add him in next chapter.